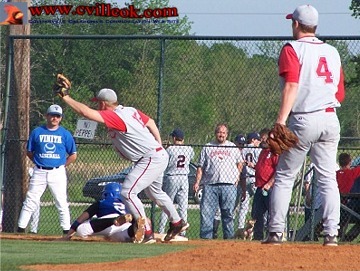 Kevin Phillips (#4) got the first out of the game on this Vinita foul pop up. 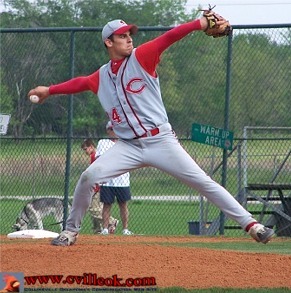 Harrison Mendez (#14) pitched the first four inning for the Cardinals. 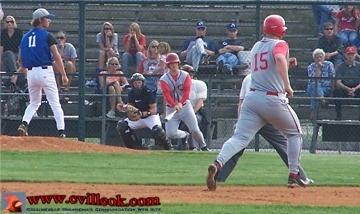 Tyler Nair (#11) started a 6-run 1st inning for the Cardinals. He led off with a walk then slid into 2nd (above) as the Vinita fielder dropped the ball allowing Brad George (#2) to reach 1st safely. Bobby Shoate (#8) heads for 1st after hitting a single which scored Kevin Phillips and sent David Chester to 3rd in the first inning. 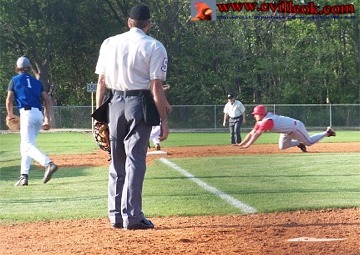 Chester had plated the initial Cardinal run with a bases loaded single followed by a 2-run Riley Murr single. 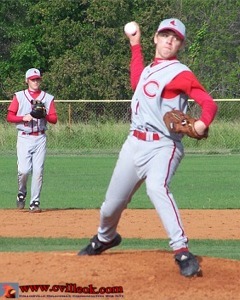 A Kyle Keith sacrafice put Collinsville up 6-0 still in the first inning. 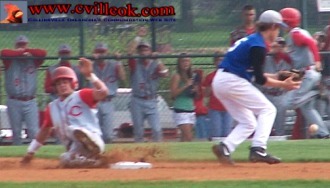 Vinita answered with 5 runs of their own in the second. Neither team scored in the 3rd or 4th innings. 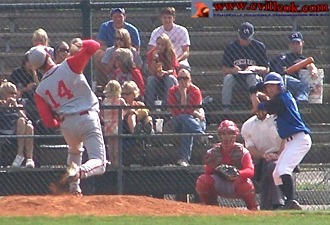 Harrison Mendez (#14) pitching (from a center field view) in the 2nd inning. 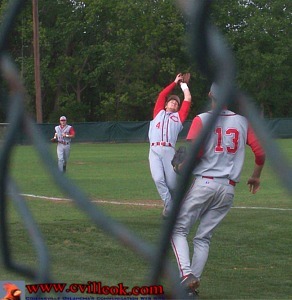 Center Fielder Tyler Nair (#11) sends the baseball back to the infield after one of Vinita's 2nd inning hits. 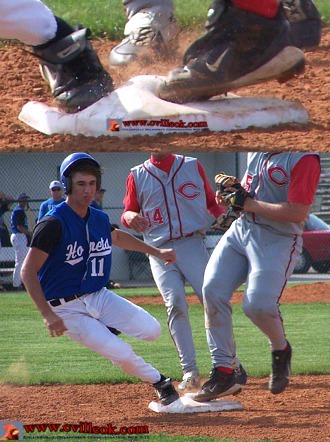 This Bobby Shoate tag at the plate ended Vinita's 2nd inning (the end of the play described in the top "2 feet on 1st" photo) with a throw from David Chester. Jonathan Woods started the 4th inning for the Cardinals but gave way to Jeremey Guest (1 batter) and Randy Rogers before Collinsville got out of the inning trailing 6-10. It could easily have been 6-11 but a Vinita runner missed stepping on home plate after tagging on a fly ball and became the 3rd out instead. 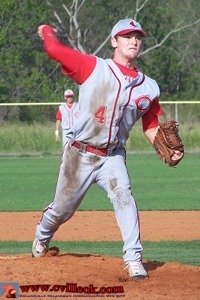 Randy Rogers finished out the 4th, then pitched the 5th & 6th innings for the Cards as they came back to tie at 11-11. A Bobby Shoate solo homer in the 5th got the Cards to 7-10. Catcher Bobby Shoate's throw to 1st (after fielding a bunt) got an out in the 6th inning but the throw from 1st to 3rd (where the plate ump is headed) wasn't in time to get the runner there. 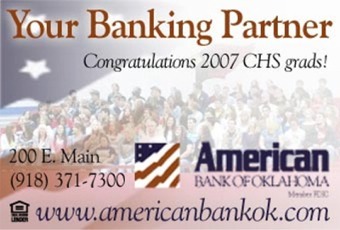 That runner scored on the next play to put Vinita up 7-11. Shawn Curtis (#1) scored in the Cards (home) half of the 6th after leading off with a double and making it home on a Tyler Nair single and an 8-11 score. 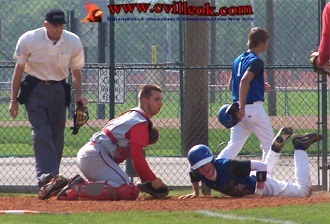 Tyler Nair (#11) scored the first of 2 runs on a Riley Murr sacrafice fly in the 6th. 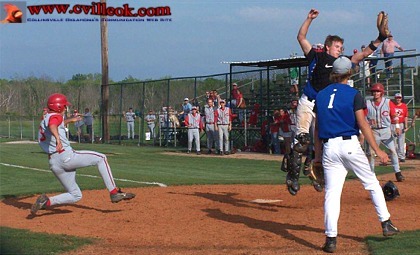 Tyler Goodman (#3) scored the second run on the Murr sacrafice after the catcher made a bad throw to 3rd and got the same back to him and Collinsville pulled to 10-11. 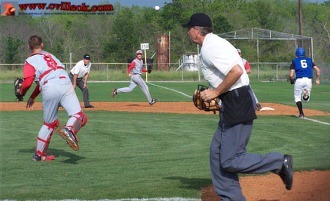 A Vinita fielding error on a Bobby Shoate long fly ball allowed Lane Coulter to bring in the 11th Cardinal run in the 6th inning. 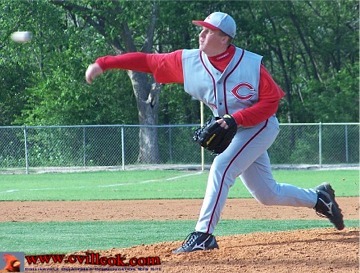 Kevin Phillips pitched the 7th & 8th innings for Collinsville. 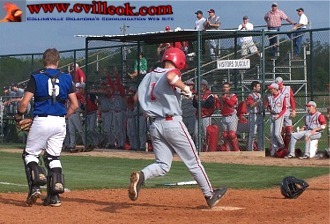 The score stayed 11-11 until a 2-out walk in the 8th was followed by a single and double to put Vinita up 11-13. 1st baseman David Chester holds up the ball to show the umpire after tagging out a Vinita runner with a pick off throw from Kevin Phillips in the 7th. 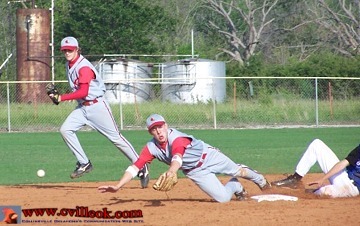 Riley Murr and Brad George try to track down a throw from home as a Vinita runner stole 2nd in the 8th inning. 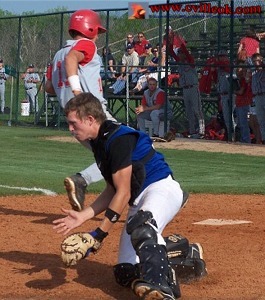 David Chester took advantage of yet another Vinita dropped deep fly and motored all the way to 3rd in Collinsville's half of the 8th but was left stranded there.